Most people think that their back and front yards are the only parts of their home that need safety precautions. Unfortunately, garage doors often go neglected in that regard. These are complex machines that require just as much, if not more, attention. We know that you wouldn't willingly put any of your family members at risk of a serious injury. However, an improperly maintained garage door can be an accident waiting to happen. These systems are comprised of many moving parts, all of which require some timely lubrication and routine inspection in order to make sure they are in an optimal condition. Always keep in mind that a lot of parts of your garage door are going to wear out no matter how good the installation was done. This is particularly true about the springs. These components are under a lot of tension on a day to day basis, and therefore can be far more susceptible to wear and tear. If they break, they can potentially hurt anybody that's standing near, not to mention render your door inoperable. If your garage door does not go up or down easily, then it is a red flag for you. You need to get the springs replaced, or at the very least examined, before they snap and hurt somebody. There are times that a spring would only need some adjustment. Remember though that delaying or failing to replace these components in due time can even damage other parts such as the hinges or the rollers. 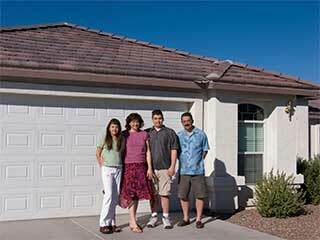 Children are always fascinated with large moving objects, such as your garage door. It is important to explain to them the dangers of playing with this system. Also, try to keep the wall mounted control panel out of a child's reach. Get it installed at least five feet from the ground in order to prevent injuries and accidents. Never allow your children to play with the remote control either. It is not a toy. The best way to avoid a lot of issues is to always contact a professional technician when you suspect something is wrong with your overhead door system. Our experts at Garage door Repair Deerfield are always here to help. Call us today.